You can’t set aside the lush irony crushing the political life out of Colorado Springs GOP U.S. Rep Doug Lamborn this week as he flails for a chance to keep his seat in Congress. Lamborn was one of three high-profile Republicans caught up in Colorado’s June 26 primary election process, which is really, quite simple. Things aren’t so simple for Lamborn, however. The six-term stalwart, right-wing Republican failed to get his way onto the primary ballot because he presented insufficient petition signatures, according to the Colorado secretary of state, also a Republican. 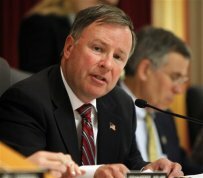 Lamborn needs a paltry 1,000 valid signatures from fellow Colorado Springs Republicans who want to see him on the primary ballot to win re-election to his 5th Congressional District seat. His problem is that he paid a service to collect the signatures, rather than collect them himself, and some of the signatures he presented were obtained by non-state residents, which is contrary to state law. After the secretary of state’s office told him he wasn’t going to make the ballot, Lamborn sued. He won the first round and lost an appeal to the Colorado Supreme Court. The high court agreed with the office of Secretary of State Wayne Williams that state law is very clear: petition signatures must be collected by Colorado residents. The SOS ruled that 327 of those signatures collected by Kennedy Enterprises, among others, were bogus because they weren’t collected right. Kennedy is a fine Colorado Springs company that offers conservative candidates and causes top-notch services, according to company officials. Website references for Kennedy come from clients peddling stellar causes such as Personhood USA, Health Care Choice for Colorado, a project of the far-right Independence Institute, and Citizens For Your Right To Vote, a 2005 notion by Colorado Springs state Board of Education rep. Steve Durham. Never is a very long time in the political life of a congressman. Kennedy references likely won’t be coming from Lamborn or other Republicans who had ballot-failure after paying them to collect signatures. GOP gubernatorial candidate and State Treasurer Walker Stapleton, who is a state resident, and whose campaign was nearly de-railed by Kennedy, called them liars and frauds. But that’s no excuse for making sure a job is done right, according to Colorado’s secretary of state and its highest court. It’s certainly fodder for state lawmakers to argue whether a petition gatherer should or shouldn’t be a state resident, or a registered voter, or of the same party as the candidate, or even a human. Those are good arguments for the Legislature to change the law for future elections. It’s not the place for the courts to bend the law for someone who should know what Kennedy Enterprises and Lamborn should have and probably did know. Or as Lamborn has been known to say when scolding places like Aurora and Denver when they argue that exceptions should be considered about immigrants because the letter of the law and the intent of the law aren’t always in sync. “The United States is a nation formed on the rule of law,” Lamborn wrote on his website during a rant on immigration and Aurora. Yes, Congressman, you’re right. And the rule of law says you won’t be voting for yourself for Congress this time.